Support DTMW – Purchase my e-book. ~ From Islamists, Communists, Collectivists and Nihilists. If you’re one of those people not yet not au fait with the internet phenomenon/subculture referred to as the ‘Dark Enlightenment’, perhaps the best way to describe it is with reference to its adherents favourite movie scene. 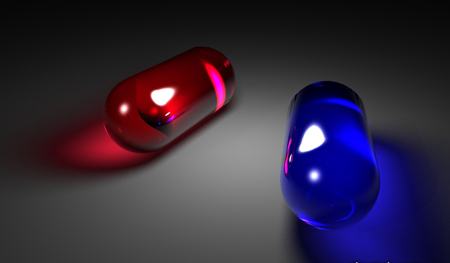 This is the moment in The Matrix, when Neo is offered two pills – one blue, one red. The man offering the medicaments, Morpheus, informs Neo that the pills have different metaphysical powers. One of them, the blue one, will send him back to the artificial world of the Matrix (a computer simulation) that he is already familiar with, completely ignorant of the existence of the alternate (real) world. The other pill, the red one, will make it impossible for him to go back to the sleep of unreality. Upon taking it, he will tumble down the rabbit-hole of the truth, however ugly or traumatic he may find that truth to be. As you’re probably aware, Neo boldly chooses the red pill, and so begins the main action of the film. Well, Dark Enlightenment adherents view themselves as embarking upon a comparably journey to Neo’s, and will often refer to themselves as being ‘red-pilled’. But what truths exactly are they discovering? What reality have they entered that is hidden from the majority? The answer is complicated. It is certainly accurate to say that the Dark Enlightenment is on the political right. Its followers have little sympathy for feminism or political correctness, and on matters of race and racial difference, their views tend to align with those advanced by the likes of Madison Grant and T.H Huxley. Furthermore, one of the labels embraced by the movement since their beginnings is ‘Neo-reactionary’; a pretty baggy definition, but one that clearly denotes a rightward bent. Some press commentators have even suggested a fascist sentiment motivates the Dark Enlightenment subculture. Jamie Bartlett (writing for the Daily Telegraph), for example, describes the bloggers associated with the movement as ‘sophisticated neo-fascists’. Denying self-evident truths risks handing intellectual authority to some very shady people indeed. The Dark Enlightenment must be replaced with a straightforward enlightenment. No ‘darkness’ is necessary.